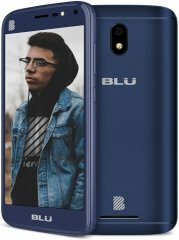 The BLU C5 2018, just like other members of BLU's entry-level C-series, is marred by several primitive cons. These include a 5-inch 854 x 480 (FWVGA) display with a measly 196ppi pixel density ratio and the disturbing absence of 4G-LTE network connectivity , which, as of this specs-based review, was a must-have feature, even for a low-caliber Android phone. Feel free to check out the newest 4G-ready smartphones here. 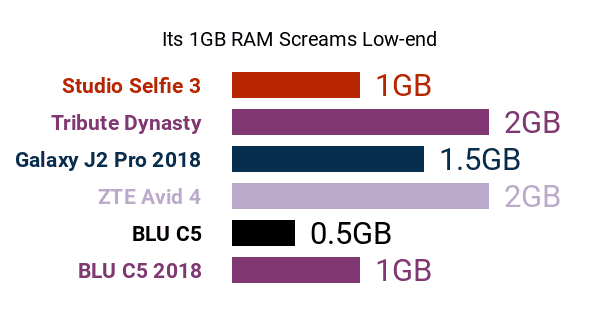 For a low-caliber unlocked smartphone (Get to know some popular unlocked dual-SIM smartphones here), this 2018 follow-up to the C5 unsurprisingly runs on elementary hardware components, which include a modest 1.3GHz quad-core processor , a Mali-400 graphics chip, and no more than 1GB of RAM . In comparison, a lot of its budget-tier competitors use basic eight-core processors and start out with at least 2GB of RAM. Given its hardware pros and cons, the C5 2018's Android 8.1 Oreo Go Edition operating system winds up as a strong selling point. Android Go, in essence, is a stripped-down Android ecosystem designed to require less processing power, use up less mobile data allocation, and eat up less phone storage, making it a good fit for an essentials-only smartphone like the C5 2018 -- don't forget to check out Phonerated's list of Android Go Edition smartphones. Going back to its hardware composition, this C5 edition is loaded with 8GB of internal memory extendable by up to 64GB , which, to us, sounds tolerable, knowing that some tantamount models stick to sub-par 4GB-only storage caps. It comes with only 2000mAh of power , though, which is exactly what the 2017 version offers. The C5 2018 does not go for anything fancy in terms of imaging to imaging, sporting a basic 5-megapixel LED-flash main camera on its rear. That being said, it could outshine some of its closest competitors when it comes to selfies, since its 5-megapixel front-facing camera comes with its own front-facing LED flash . It also offers dual SIM card slots, which is always a welcome perk in this Android category. So, when it comes to technical pros and cons, the BLU C5 2018 is a run-of-the-mill low-end Android, but its Android Go platform looks to make a huge difference performance-wise.